We have been running almost since the day we could walk. It has even been argued that endurance running has contributed to the evolution of the human body.Â Likewise, music has also shaped the development of man. However, it has only been recently that both running and music could be experienced together, and today it seems we are at that nexus. Finally a true melding of technology and music intended to enhance the runnerâ€™s endeavors.Â Bulky Walkmans are now nano-sized iPods, and heart rate monitors and pedometers are now smaller than our thumb. The new NB639 from New Balance/iHome is proof. 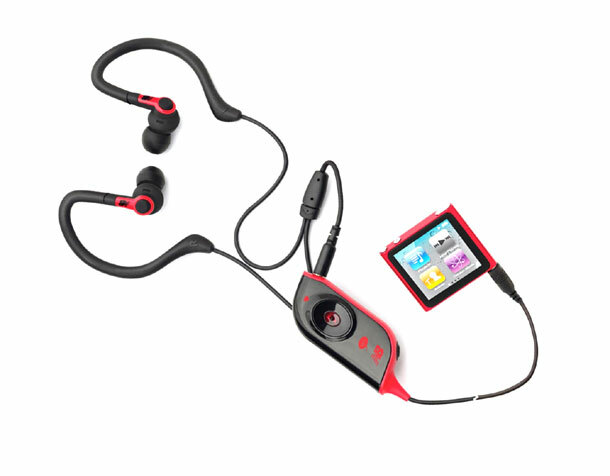 The NB639 combines a heart rate monitor, pedometer, earphones, and the free HeartPal software into one. The goal is to make your workouts enjoyable and worth while.Â New Balance, an obvious leader in sport of running, and iHome, the makers of fantastic little audio gadgets for your iPod, iPhone, and iPad, have teamed up and brought to market the NB639 for $99. The hardest part of setting up the NB639 was getting it out of the box.Â It seems that the removal of packaging is more complicated than software is to install.Â But once I got the unit out, the CD-ROM in the laptop and clicked the install button, the HeartPal software installed on my Vista Pro OS without issue. The NB639 uses a USB adapter that links both the heart rate/pedometer monitor unit to your computer and charges the unit at the same time. I let the NB639 charge over night and the next morning I was ready to run. A few brief comments on the software before we move on.Â The HeartPal software allows for multiple accounts, so you and a partner could in theory share one unit, as long as you donâ€™t work out at the same time.Â The software profile/setup includes age, weight, height, distance of stride for walking and running.Â And though software keeps tracks of, distance, time, and number of runs, it doesnâ€™t easily display the number of calories burned.Â But a lovely voice assistant in the unit will give you the results of your daily efforts. As a child I almost never looked at the instructions that came with my Legos.Â That habit, for better or worse, has followed me into my 30s. So after a brief glance at the instructions, noting the on/off button, I clipped the unit onto my shirt and was off.Â Luckily, for me and the many others who also never read the Lego instructions, the NB639 isnâ€™t that hard to figure out.Â After clicking the start button a gentle female voice prompted me to place my thumb over the sensor so my heart rate could be read.Â To my surprise the NB639 announced I had no heart beat. And unfortunately I almost started to believe it after trying two or three times to get my heart rate to register. But after finding the trick of very lightly placing the thumb over the sensor the unit, it easily registered my pulse and I no longer pondered the possibility that I may, in fact be a zombie. The only thing I wish the NB639 did was give the voice instructions to go running. I kept fiddling around looking for the next step or start button after my heart rate was taken.Â But the next step is to literally, just go running. The earphones that come with the NB639 seem to be industrial tough, not that they are uncomfortable to wear, quite the opposite. But these definitely give the impression they can take a lot of abuse.Â The earphones do detach from the heart rate/pedometer unit, in case something does happen to them, or you prefer to use another set. The earphones provide a secure in ear-fit, and they use an ear-shaped plastic piece that the cable inserts into, to stay in place.Â The flexible shaped plastic goes up over the back of the ear holding the earphones in place while you run. Most importantly the cable, when rubbing against your shirt, doesnâ€™t transmit interference noise to the earphones. Sonically the NB639 gets the job done but offer little flare.Â They have a clear mid-range with relaxed highs and a very present, but slow bass.Â For techno, rock, and other work out music, they produce a strong beat that keeps your energy up and body moving.Â For better or worse the relaxed highs offer a non-fatiguing sound and the clear mid-range does give both male and female vocals a solid and clear presentation. Soundstage is a bit cramped but dynamics are somewhat lively at a normal volume.Â Overall the earphones are absolutely adequate for music while running or exercising.Â Strangely, or maybe it does actually make sense, running with adequate earphones versus very high-end earphones, like the Shure S345, makes almost no difference, at least in my experience. With all the bouncing, body noise, concentration of running, one really only needs a clean mid-range, and driving bass, and present highs.Â Anything above not being irritating is great, but it isnâ€™t required.Â And the NB639 offer just that. We can absolutely recommend the NB639 to anyone looking for an easy, no none-sense training tool. Â The NB639 cost $99, sounds good, keeps tracks of the essentials and is easy to use.